Which Country Is The Largest Beef Exporter? Which Of These Christmas Films Was Originally Released In The Spring? Although the United States has a long history of beef production and images of cattle rustling and ranching permeate the cultural narrative of the wild west, many Americans would be surprised to find that their country is not the largest exporter of beef in the world. That distinction belongs to Brazil. In fact, in 2014 Brazil exported 2.23 million metric tons of beef while the U.S. exported only 1.14 million metric tons, giving Brazil an export volume nearly double that of the U.S. 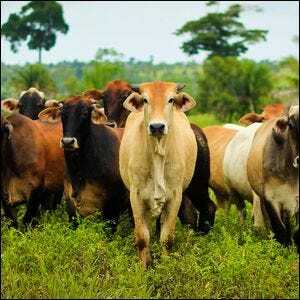 The Brazilian beef industry has expanded significantly over the last few decades and at an ever increasing pace (the number of cattle in the country has risen from ~78 million back in the 1960s to well over 200 million today). While many people think of deforestation of the Amazon rainforest and associate it with a global hunger for exotic lumber, 70 percent of Amazon deforestation (and 91 percent of all land deforestation in the country since the 1970s) has been driven by agricultural demands and the land is now used for livestock pasture. Image courtesy of Andre Agostini.